Now, this is not a quick meal if you’re making it start to finish when you get home from work. But, I have started roasting the squash and adding the toppings the day before, let the pan sit in the fridge overnight, and then toss it in the oven for 35-40 minutes for a delicious meal by 6:00 that reheats beautifully in the microwave. My freezer isn’t big enough to hold freezer meals, so I don’t know how this would turn out if you made it and froze it for later. Because it is just J-Mo and I at home I only used half of a spaghetti squash in an 8×8 pan, you could easily double this recipe in a 9×13 for your whole family or lots of leftovers. Either cover and let sit in the fridge overnight until you’re ready to bake, or put back in the oven immediately for 35-40 minutes until the cheese is bubbly and delicious and the top is getting a nice golden-brown color. I needed to add some salt to mine before I ate it, spaghetti squash is a big, fat, vegetable and needs a bit of savory goodness to bring out it’s best flavors. However, depending on what toppings you have your needed salt quotient will probably drastically change. So, taste it and add at the end instead of trying to salt it at the beginning, go overboard, and end up with artichoke-goat cheese brine. 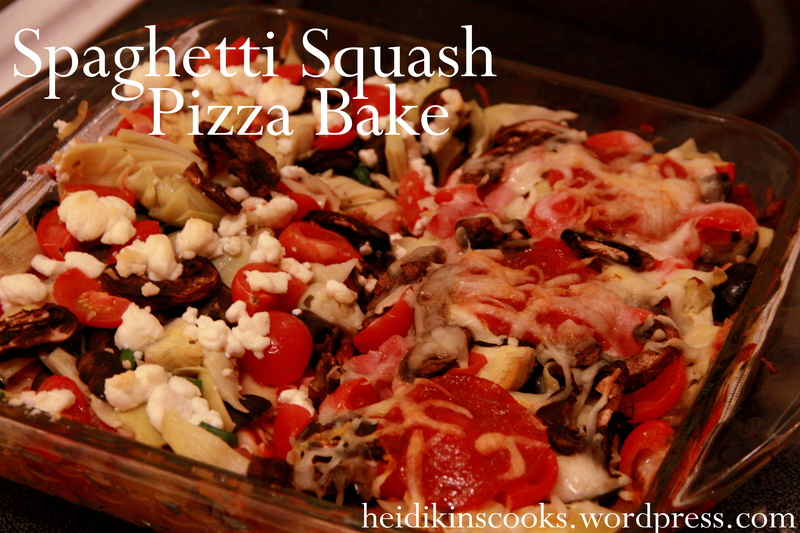 I’m sure you could use any other pizza toppings you like: sausage, pepperoni, wilty spinach, ricotta, roasted zucchini, pineapple (if you can handle fruit on pizza), BBQ chicken, crumbled bacon, sun dried tomatoes, salami, gouda, gorgonzola, harvarti or another delicious cheese…the topping ideas are really endless!